Satisfying mechanics – Pool Nation’s control scheme is really quite commendable. The precision and fine-tuning capabilities afforded to the player maintain a constant sense of absolute control. And thanks to a comprehensive tutorial mode that teaches basic and advanced shots alike, it’s all relayed in an easily understood manner. In-game, you’ll rarely call on some of the more advanced techniques, but there is always a way to tackle any given situation. The paths of both the cue ball and the first ball hit are telegraphed before players commit to a shot, so you can virtually guarantee the success of certain pots. However, there’s some guesswork involved in bank shots and those involving more than one ball. That balance feels about right, and as such, it’s always mechanically satisfying to play and presents just enough challenge. Sights and sounds – Pool Nation does an admirable job of pulling players into the sensation of playing a real game, and this is due, in large part, to its 3D graphics. There are some beautifully modeled playing environments on offer, ranging from high-end, trendy bars to corporate office-like environments. 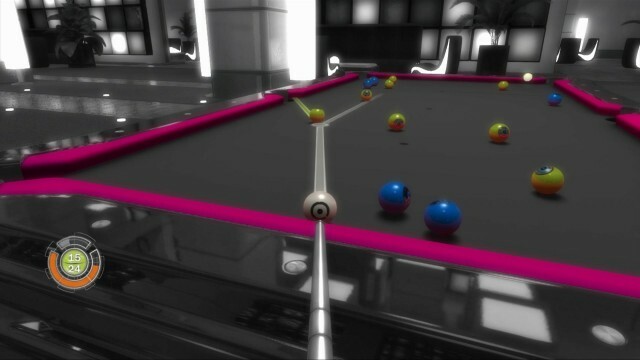 The lighting is particularly impressive, with Pool Nation’s shiny pool balls and table edges reflecting the environments in a realistic fashion. One slight problem, though, is that a great deal of the time, the bird’s-eye-view setting provides the best vantage point from a tactical perspective. And unfortunately, most of the game’s graphical appeal is lost on the player from this vantage point. 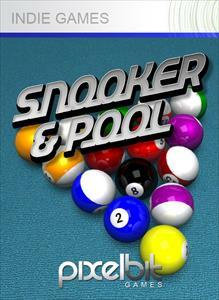 At these times, Pool Nation’s key differentiators from the likes of Bankshot Billiards 2 are moot. In an understandable move, player character models have been left out of the equation altogether. Instead, players essentially control a floating pool cue, which doesn’t obscure the action and enables complete, unhindered maneuverability. There’s a modest variety of background music on offer, some of which seems extremely ethereal, contemplative and at odds with many of the environments, not to mention the nature of the game. However, there are a couple of funky, lounge-style songs that, preference aside, suit this style of game well. 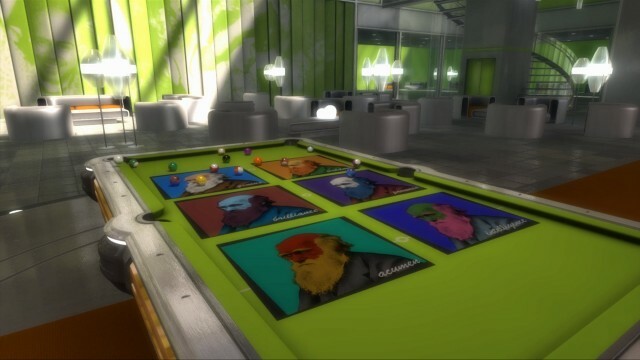 Variety – Players can enter both 9-ball and 8-ball matches and tournaments from the main menu. Both of these games are quite different, and each requires a different approach. At certain points within any given tournament, players will encounter opportunities to play special, pool-variant mini games (more on this to follow), such as sinking a set number of balls in as few shots as possible. And of course, there are the obligatory local and online multiplayer modes for some human competition. Worthy of special mention, Cherry Pop has also included what’s sure to be the mainstay of Pool Nation: an addictive Endurance mode. This is a hectic, timed mode where balls are added to the table almost faster than the player can conceivably sink them. The goal is to last as long as possible while attempting to prevent a total of 24 balls from ever being on the table at one time (at which point, it’s game over). A string of successive pots enables the player to temporarily stop the clock, providing a vital chance to reduce the number of balls. You won’t have time to agonize over shot angles in this mode, and being leaderboard-enabled, it’s bound to encourage some intense friends-list competition. Reason to return – Pool Nation employs a couple of clever tricks to make sure to maintain interest for longer than first impressions might suggest. Sure, 95% of the play in a standard game probably won’t require the execution of any of the advanced skill shots in order to win. But thanks to Pool Nation’s Challenge feature, players need to pull some of these shots off occasionally if they hope to unlock every cue, ball and decal variant available. In every tournament match, three specific challenges are issued, such as reaching a certain point score, sinking a certain number of balls in a row, or even sinking the final ball with a certain skill shot. If the player can achieve all of those within certain matches, they unlock a special, one-off challenge match with some unusual game variant. Victory in these matches awards the player a new customization option. Put another way, there’s reason to return even after you’ve simply beaten every character in every tournament, and it will require true mastery to beat every challenge. That empty feeling – Unfortunately, although the environments mentioned earlier are attractive, they do feel rather soulless simply because they’re unpopulated. There’s no other activity in these wide, open spaces, and so these games of pool feel like they’re taking place in the loneliest, emptiest of environments. Pool is a pub game through and through, and pubs should be bustling with activity (or have a handful of patrons, at least). It’s a small gripe, admittedly, and perhaps a big ask of a downloadable title, but it’s jarring all the same. Being a physics-based game of skill, there’s a certain challenge in making pool interesting enough for the typical video-game audience. But with Pool Nation, it’s a challenge that Cherry Pop Games has grasped with both hands, resulting in a fun, functional and attractive adaptation of traditional cue sports. Playing this digital version and pulling off match-winning jump shots is just as satisfying as the real thing, excepting the possibility that there might not be anyone around to see it. Its niche appeal makes it hard to unreservedly recommend to everyone. But for those who like the idea of playing pool in their living room, this is a comparatively inexpensive way to do so.